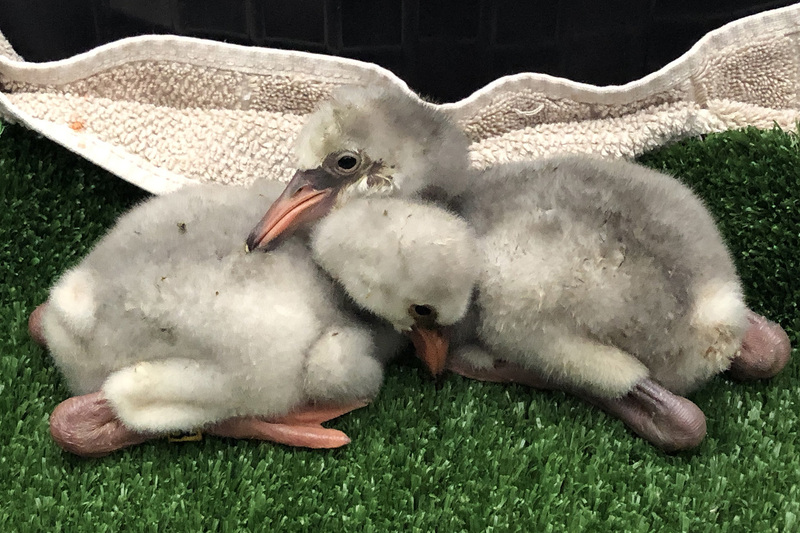 Two of the rescued lesser flamingo chicks cuddle up at the SPCA in Kimberley, South Africa. The most urgent, wide-scale rescue of wild lesser flamingo chicks in South Africa is underway after 1,800 chicks were found abandoned at their nesting grounds. The international zoo and aquarium community has joined forces to help save the chicks in a massive rescue operation, sending critical funds and avian experts from across the world to South Africa. A severe drought has affected Kamfers Dam in Kimberley, the capital of the Northern Cape Province of South Africa, causing adult flamingos to abandon their nests, leaving thousands of eggs and chicks behind. With only four breeding colonies of lesser flamingos in Africa and one other in India, Kamfers Dam is one of the most important breeding locations for this species in the world. Dallas Zoo’s Senior Zoologist Julie Farrington hand feeds a rescued chick. The Dallas Zoo is leading an emergency rescue effort to funnel funding to South Africa in coordination with the Pan African Association of Zoos and Aquaria (PAAZA). The Dallas Zoo has contributed $18,500 to the rescue effort, and is sending multiple waves of support staff to Kimberley. Animal Care Supervisor Kevin Graham and Senior Zoologist Julie Farrington arrived in Kimberley last week, and Dallas Zoo veterinarian Dr. Marren Connolly and veterinary technician Cassandra Reid arrived Sunday and will remain there for three weeks. 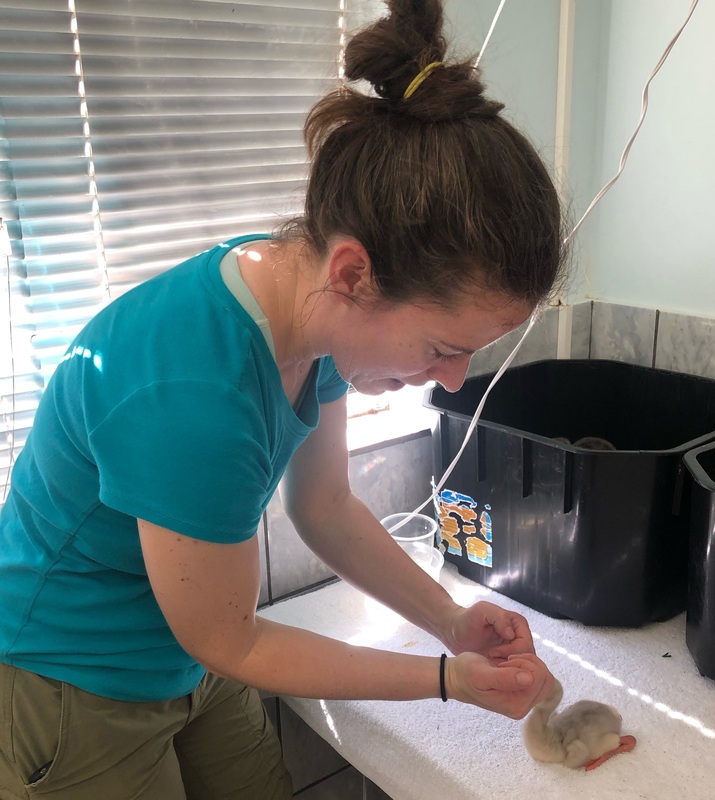 The 1,800 chicks are being cared for at a number of PAAZA accredited zoos and aquariums, plus, certified partners like SANCCOB, as well as, by staff at the SPCA in Kimberley. An international team of conservationists, zoologists, vet staff, and more are working around the clock to bring the chicks up to good health. The ultimate goal is to release the birds that have been successfully rehabilitated back into their natural habitat by late May, so they can rejoin the flock. With nearly 20,000 birds nesting at Kamfers Dam, a significant hit to the flock could pose long-term problems for the population without intervention. Conservationists are working to implement a detailed plan of action for the future, should a rescue mission like this occur again. Lesser flamingos are currently listed as near threatened by the International Union for the Conservation of Species (IUCN), primarily due to habitat destruction and climate change. It is the smallest species of the six species of flamingos in the world. They’re found primarily in sub-Saharan Africa and some parts of India. The Dallas Zoo cares for more than 30 lesser flamingo chicks in the Wilds of Africa section of the zoo. 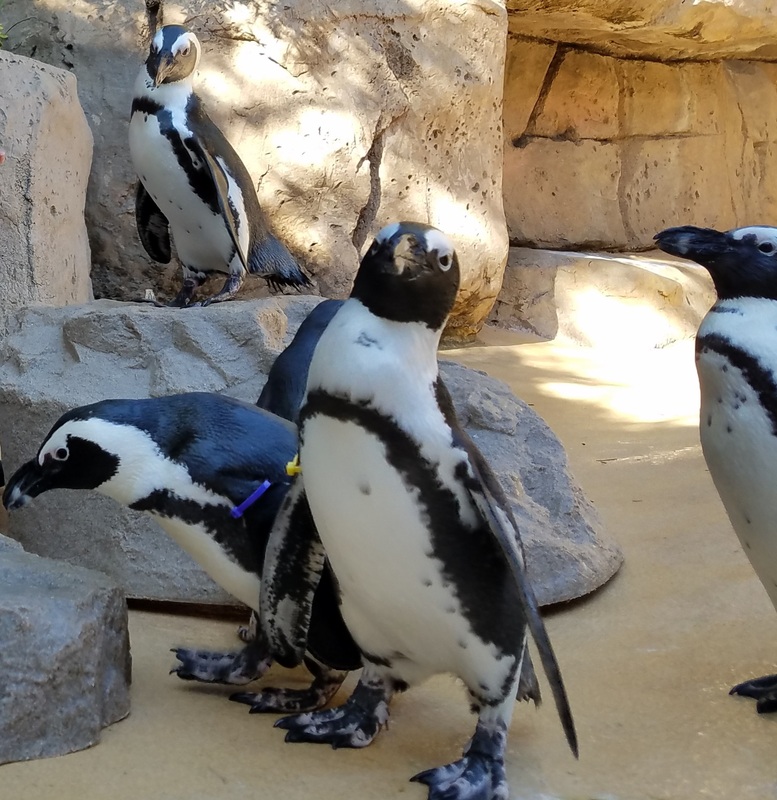 It’s Penguin Days presented by Highland Capital Management at the Dallas Zoo! In honor of this cool $8 deal, we’d like to introduce you to 8 very special birds. The members of our African penguin flock at the Don Glendenning Penguin Cove are pair-bonded, which means they sleep, eat and play together, and a few of them are also breeding pairs. Basically they’re bffs, which we think is pretty sweet. Always buy sustainably raised of caught seafood. Download the Seafood Watch app to easily tell the difference! Opus gazes up at his keepers. Opus is our baby! At just two years old, this curious boy loves to be part of the action. He’s constantly running around playing and just being a rambunctious toddler. Marina is the introverted, artistic type. She’s shy, sweet and loves to paint! You can pick up one of her masterpieces in the Zoofari pop-up tent by the front gates. Proceeds benefit enrichment items for our animals. The oldest member of the flock, Splash is our feisty mother “hen.” When Splash has eggs or chicks to raise, she will defend them fiercely. She’s definitely mom goals, that’s for sure. Klondike is a loving, dedicated dad and loyal to his mate, Splash! He loves her more than anything. Pickles (on the rock), Tazo, Althea and Charlee at Penguin Cove. Pickles is the social butterfly of the bunch. You’ve probably seen him greeting you at the viewing window at the Penguin Cove. He loves company and interaction! And he just hates to be without his mate, Althea. This girl is sassy and fearless! Althea is usually the first penguin to investigate new things – whether it’s a new food item, or training activity, she’s the bold one who leads the way. Charlee is another feisty lady – with a big appetite! She definitely loves meal time, and her keepers love to watch her fun personality. Tazo is the flock sweetheart. He’s one laid-back guy and a smart cookie too! He loves to participate in training and usually picks up new behaviors lightning fast. Be sure to stop by Penguin Cove on your next visit! 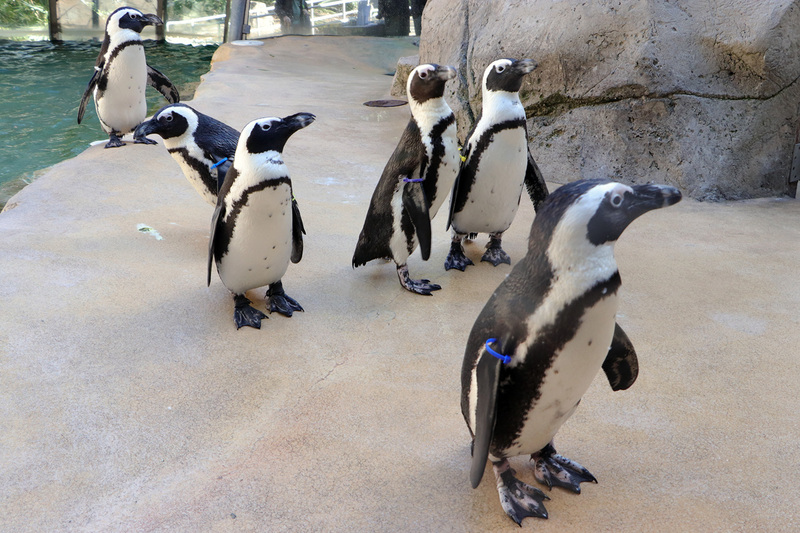 Plus, during the month of January, celebrate Penguin Days with some extra fun activities. Click HERE to learn more. Two of our team members will join the ranks of renowned conservationists like Jane Goodall and Jacques Cousteau, as National Geographic Explorers, working on personal field conservation projects across the globe. 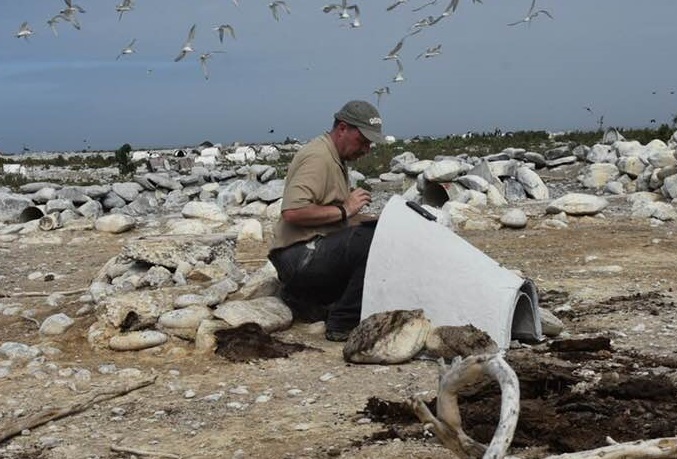 Kevin Graham on South Africa’s Dyer Island installing the artificial nests. In addition to caring for Dallas Zoo’s birds, Graham has worked hard to save African black-footed penguins in South Africa for the past three years as the Artificial Nest Development Project Coordinator for the Association of Zoos and Aquariums (AZA). He leads a team that studies, designs and installs artificial nests for the penguins to lay eggs in. Over the past 100 years, the population of African penguins has declined from more than two million breeding pairs to slightly more than 20,000 breeding pairs left – that’s a more than 98-percent population decline mainly due to improper nests that fail to protect their eggs. 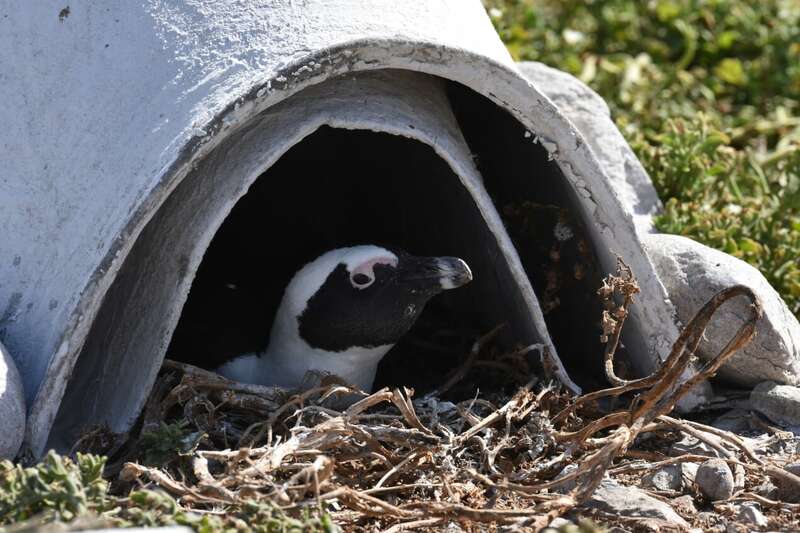 African penguins burrow and nest in guano (a term for their poop), but decades ago, Europeans and South Africans began removing the guano to use as fertilizer, leaving the penguins’ eggs vulnerable to predation, human activity, and the elements. There are currently only 27 natural guano nests left. An African penguin sits on an egg inside the artificial nest. 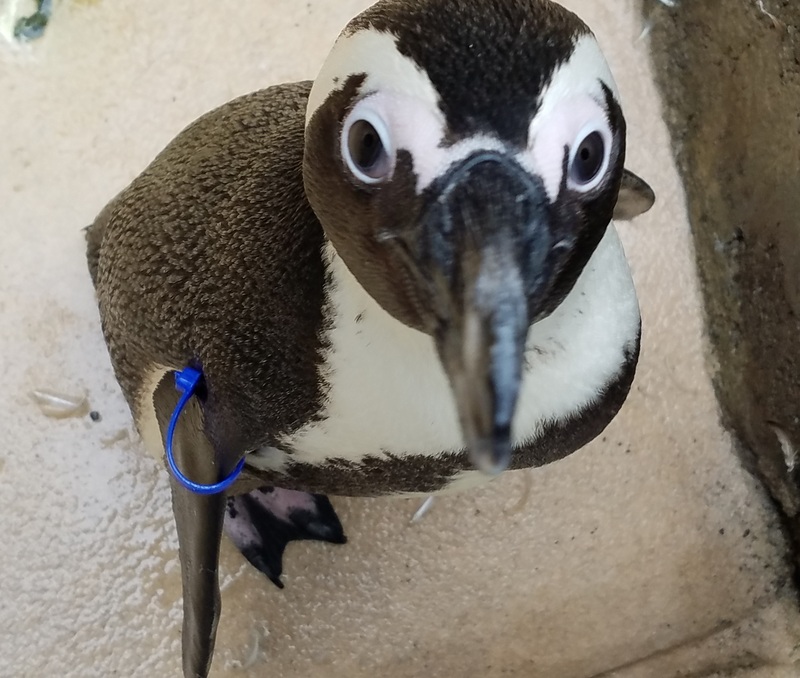 In February 2018, Graham joined forces with AZA scientists, the Dyer Island Conservation Trust and Pan-African Association of Zoos and Aquaria (PAAZA) to install 200 artificial nests in two South African penguin colonies. After extensively testing various artificial nest prototypes, two designs were penguin-approved. At the end of the testing period, the scientists learned that approximately 96 percent of the nests in the study were utilized by the penguins, just over 80 percent had eggs laid in them, and more than 56 percent had successful chicks. Over the next few months, the team will build 600 more nests to install, which is where the grant funding will come into play. Long-term, Graham hopes to have 6,000-7,000 nests installed in total. With one-third to one-half of all amphibian species worldwide threatened with extinction, conservation action is absolutely critical to preserving herpetological biodiversity. 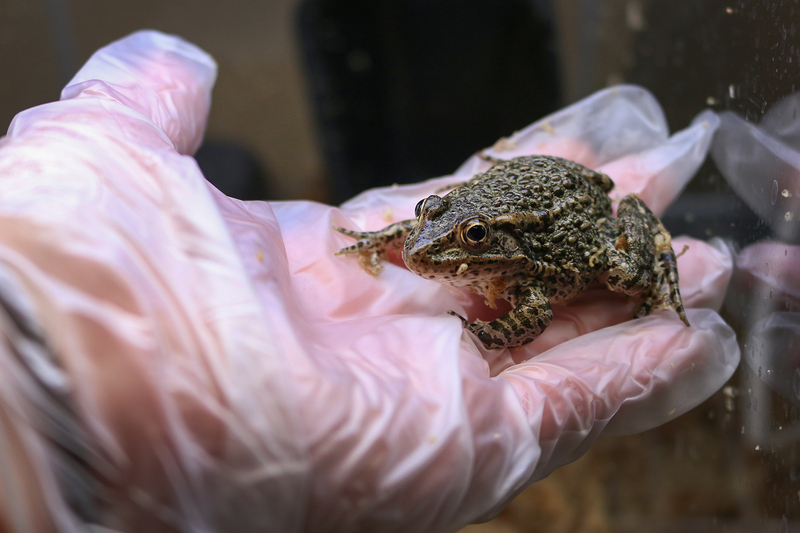 The Dallas Zoo is taking the next step to develop assurance populations of three threatened amphibian species – the dusky gopher frog, the Houston toad, and the Puerto Rican crested toad. 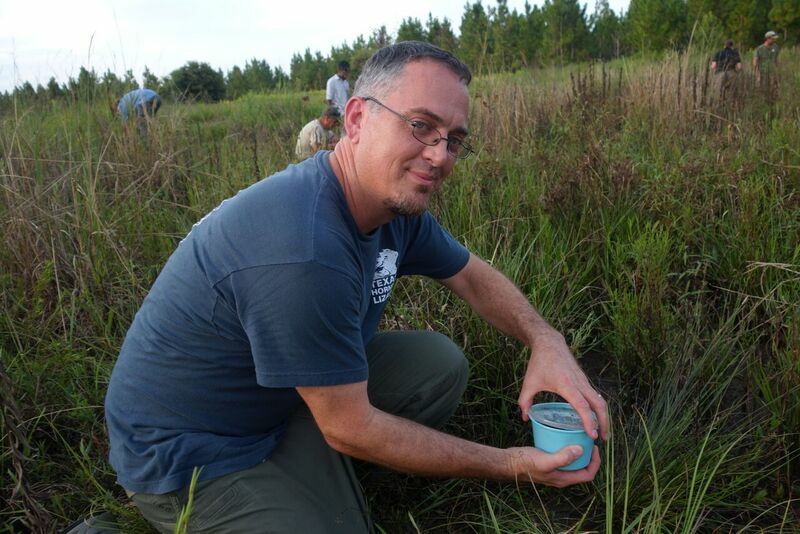 Ruston Hartdegen releases a dusky gopher froglet back into Mississippi’s DeSoto National Forest. This past summer, we opened a behind-the-scenes Amphibian Rescue Center where our herpetologists are working to produce healthy offspring to release back into their natural environments. We are already leading efforts to protect the dusky gopher frog, one of the most endangered amphibians in the world. In October 2018, herpetologists released new froglets from our existing dusky gopher frog population into their native habitat of Mississippi, where the frog is endemic to only three small ponds in the DeSoto National Forest. With the help of the National Geographic Society grant, Hartdegen is expanding the Amphibian Rescue Center to accommodate two new breed-and-release programs – the Houston toad (currently only found in three Texas counties) and the Puerto Rican crested toad (the only native toad on the island) – helping a total of three species increase their numbers while protecting genetic diversity. A dusky gopher frog at the Dallas Zoo Amphibian Rescue Center before its release. The National Geographic Society funding marks the first time our staffers have received support from the Society in its history. Since its inception 130 years ago, the National Geographic Society has supported the work of more than 3,000 Explorers in the field. Creating A Better World For Animals is our thing. Every. Single. Day. And each year, we proudly donate hundreds of thousands of dollars to wildlife conservation efforts across the globe and in our backyard. 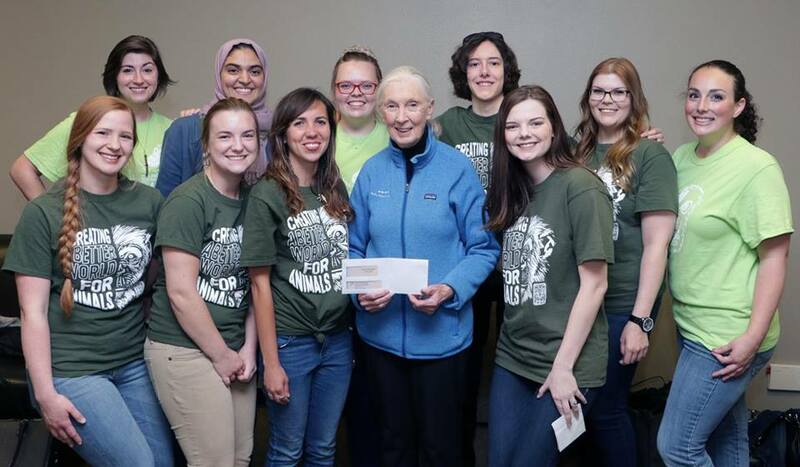 Through a new grassroots fundraising initiative on our campus, we’ve raised nearly $80,000 for wildlife. Our Zoo guests have become conservation heroes during these new saving wildlife-focused weekends. With the help of our interns, we’ve sold specially designed T-shirts, stickers, wristbands, artwork, and more, and have raised funds to protect animals like, endangered chimpanzees, Texas’s iconic whooping cranes, and Africa’s most endangered cat, the cheetah. Here’s a look back at what we’ve accomplished in 2018. 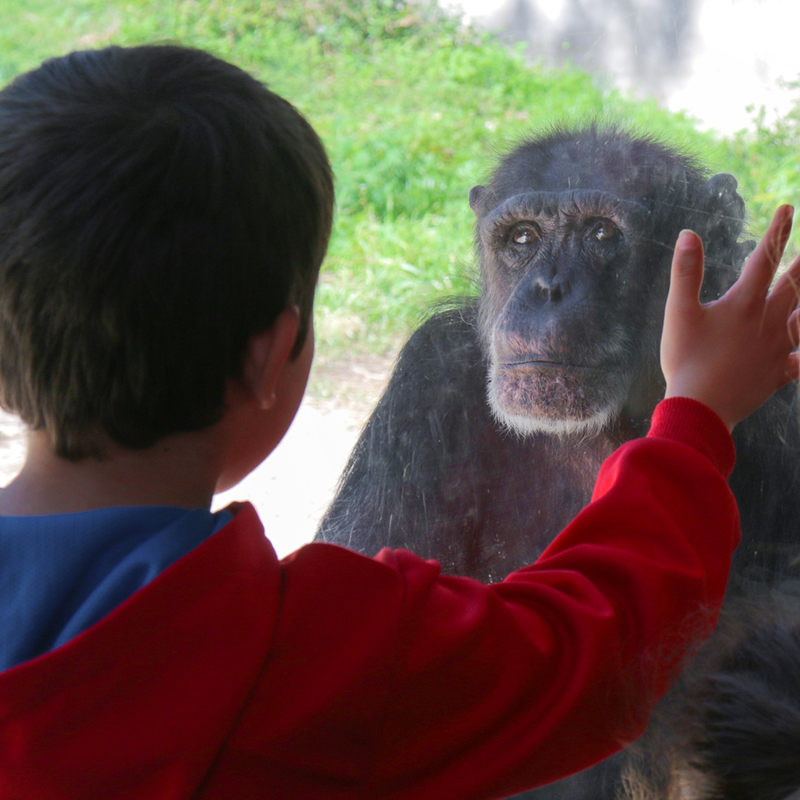 Chimpanzees: During spring break, we set a goal to raise $14,000 for the Jane Goodall Institute to care for two rescued chimps in South Africa. We proudly delivered the check to Jane while she was in Dallas on a speaking tour. It’s not often we can present a check in-person to a conservation partner, let alone one of the biggest wildlife conservation heroes of our lifetime. Whooping cranes: This summer, we raised an incredible $25,000 for whooping crane conservation. There are less than 800 whooping cranes left – in the wild and in human care. The DFW area serves as a pit stop for these Texas icons as a flock of about 400 cranes migrate annually from Canada to the Aransas National Wildlife Refuge on the Texas Gulf Coast. Cheetahs: During the fall, we raised $15,000 to protect cheetahs, including a special project with the Cheetah Conservation Fund (CCF) to help feed and care for two orphaned cheetah cubs at their sanctuary in Namibia. We started this grassroots fundraising effort last year when we set out to save the vaquita through a weekend “beach party.” As the world’s most endangered marine mammal with fewer than 30 left, they needed help fast. For an animal that Zoo guests could not see, and one that many had not heard of, we raised an impressive $15,000 in a few short days. And we haven’t stopped since. Join us in 2019 as we roll out Dallas Zoo’s new conservation plan – it will provide our roadmap to saving species for the next decade. In the meantime, look for more ways to help by becoming a part of our Wild Earth Action Team and join our boots-on-the-ground efforts, email us at volunteers@dallaszoo.com for more information. It’s been a WILD ride since August, when class was officially in session at the Wild Earth Preschool! As the only full-time nature-based preschool in South Dallas, this was a big deal for us. These pint-sized zoologists have truly proved how important incorporating nature into our kids’ lives really is. 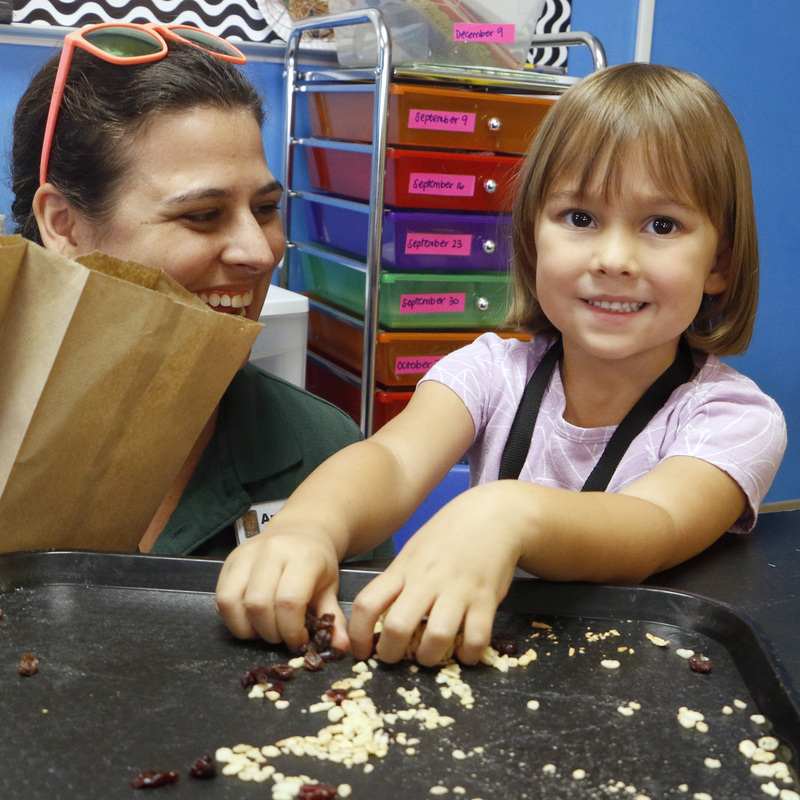 Wild Earth Preschool is the only nature-based full-time preschool in South Dallas. We’ve got one fully enrolled class for this year and interest lists forming for every season until 2021! Our flexible schedule meets the needs of parents working both in and out of their homes. Families from all over the Metroplex, from Oak Cliff to East Dallas and Arlington to Argyle, have made us their preschool-of-choice. Building an environmental-STEM vocabulary with words such as habitat, predator, compost, protection, shelter, larvae, life cycle, and more. The students are using these words in correct contexts unprompted. Developing an empathetic, responsible, connected classroom family. Students learn self-regulation skills, conflict resolution, and have classroom jobs such as conservationist, gardener, navigator, librarian, and song-selector. Our students are becoming Zoo and wildlife ambassadors, doing things like picking up discarded Zoo maps to recycle and even educating guests about our animals.